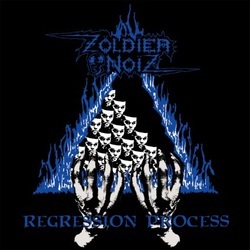 Zoldier Noiz is a dark French thrash band that has been around for about 15 years in one form or another and this is their second album following 2009's Schizoid Reject and not counting a live album they put out a couple years ago. They are definitely close to their German neighbors in style and sutstance as this CD sounds like something that Kreator or Destruction or even Sodom would have put out. The vocals are very gruff and close to all out growl, but still understandable in most cases. The guitars are tight and riff heavy with some great solo work thrown in over small bursts. The drums are flat out scorching in this and really do a fantastic job of hammering the music at you full speed ahead. Between the frenetic drumming and the blazing speed guitars working in tandem there is a lot of psychotic energy being unleashed. As a friend of mine often says if you ain't moving to this you better check your pulse as you are clinically dead! The entire CD moves by blazingly quick, part of the reason is the music just blazes on and part of the reason is that the songs are a bit short. This is a bit of a negative though as it is hard to really get into one song before it ends and you are hit with another. Combine this with the fact that they do not vary much from their full speed in your face sound, that no one track really sticks out and shines and sometimes you almost don't realize that the song has changed. This CD is a great thing to put on if you need to work out some aggression or frustration after a long work day or some other issues. I can imagine that the mosh pits at their shows are pretty sick too! Just push play and 'bang on! !